The dinar’s value against the US dollar continues to drop (Photo: Libya Herald). 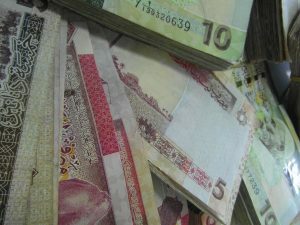 In a single day, the dinar has collapsed over seven percent against the dollar, falling through LD6 for the first time to end this evening at 6.2 on the black market. Presidency Council chairman Faiez Serraj has blamed the currency’s collapse on the Central Bank and its governor Saddek Elkaber. However, today a CBL spokesman said the bank had nothing to do with the dinar’s fall. Explaining that the bank was not surprised at what was occurring, Essam Al-Oul told the Libya Herald: “ What happened today is the logical result of different factors including the decrease in oil exports and international prices, the sharp political splits and civil war which has torn the country apart, the chaos from the absence of security, in addition to the freezing of the operations of some important government bodies such customs and anti-smuggling organisations”. Oul added “ If none of these is solved, the crisis will remain and CBL has nothing to do with this”. Today’s plunge in the dinar’s value came after it closed at 5.62 to the dollar on Thursday. There were no published fixes yesterday. As the markets opened this morning the price of a dollar rose quickly to 5.82 and then climbed slowly past the LD6 mark. When the dinar move through the LD 5 to the dollar in July, it was described as a watershed moment and a wakeup call. There remain however suspicions that the money dealers have actually been manipulating the market. “Taha” a gold market trader insisted to this paper that his was a risky business. “The prices can never be predicted” he said but added “ However, I bet that the large traders are working with each other to play the rate and are making a lot of money from this”. Meanwhile, there are also those who are sure the dinar’s fall is due to outside manipulation. “I am quite confident that there are foreign hands behind this which seek to fabricate a crisis in our country,” Siraj Abunab of Tripoli told the Libya Herald.